Jeremy S. sent me a link to a Hanna Rosin article talking about her struggles to remain in the kitchen as her foodie husband micromanages the microplaner. I usually like Hanna Rosin and her story was amusing enough, but she makes the error of assuming that her family drama is a typical family drama. She moves from the first person singular pronouns to the first person plural pronouns. There's no evidence that macho chefs on the Food Network are leading to a mass movement of men in the kitchen. As Michael Pollan wrote, the Food Network has resulted in food spectators, rather than food makers. After we were married and Jonah was a baby, Steve and I cooked together a lot. We made Jonah fresh, organic baby food, and Steve brewed his own beer in a vat in a closet. We were able to be happily chopping vegetables together at 5:30, because we were in graduate school. We didn't have jobs. Now, Steve doesn't walk in the door until 6:30 or 7:00 or later. He's lucky if he can eat with the rest of us, instead of warming up leftovers in the microwave. He'll cook one meal over the weekend, but it usually involves frozen tater tots. Even when Steve was home, he wasn't cooking porcini risotto. He was making fish sauce. Steve doesn't like nouveau cuisine. He prefers traditional cuisine. Really old cooking. From the Roman Era, if possible. He got his hands on a cookbook of ancient Roman dishes. I think the cookbook was meant for historical study, rather than actual implementation. The Romans were really into a fish and wine sauce that was reduced into a viscous consistency. I think it was called golum or gorum. I can't remember. Steve'll give you a long lecture on how the modern Worcestershire sauce is a descendant of the Ancient Roman fish sauce. Anyhow, this stuff was nasty and really smelled up the place. I can't say that I miss the fish sauce at all. Most men might not be the porcini risotto-types like Rosin's husband, but they are slowly, very slowly, doing more domestic work. The annoying thing is that as men take on domestic work, it suddenly becomes cool. Example A has to be all the articles on Stay at Home Dads. There have to be more articles about Stay at Home Dads, than actual Stay at Home Dads. In a few years, there's going to be a guy version of Martha Stewart. He's somehow going to make vacuuming cool. Get ready for it. I had my first introduction to Asian fish sauce this summer. That is powerfully stinky stuff, even just from the bottle. I heard a radio show once about a couple who tried to recreate a dinner from both ancient Rome and ancient Gaul. It was very hard, in part because we don’t know all of what they ate, but also because the plants are very different now, as our our tastes. But the Roman meal was supposed to have peacock tongues that couldn’t be found. Duck tongues, from a China town store, were the substitute. But duck tongues have a bone in the middle of them and so much be eaten very carefully. Also, in my experience, they are not that great. So if Steve ever offers to make you a bird tongue appatiser I’d say no. As for housework being cool, I’d say just enjoy it if you can. And on the article, I’d guess that the slip from “this is my experience” to “this is group x’s experience” is one of the curses of the blog world. Matt, peacock tongues are much better than duck tongues. Well worth not being able to go to the zoo anymore. I have Shakespeare’s Kitchen, which contains modern versions of recipes from Shakespeare’s day. I love it, though I don’t cook from it much. The kids don’t like their meat spiced with cinnamon and nutmeg. 🙂 There’s a recipe for cheesy rice balls, though, that’s really good and reasonably easy to make. So, if you’re still looking for xmas presents . . .
Mr. Geeky doesn’t cook. I sometimes wish he did, but actually, I’m a bit of a food snob myself, so it’s probably better that he doesn’t cook. The kids, even the boy, have shown some interest in cooking and they help out from time to time. I’m hoping the boy will gain more cooking skills than Mr. Geeky has. His mother didn’t cook–she dumped things out of cans and heated up frozen stuff–so there was no real way for him to learn. Not very many of the relatives in his family cook real food, which is very sad and makes family visits excruciating for me. A few greats aunts pop out the homemade noodles and sweet potatoes, but otherwise, it’s a vast desert of canned products. Sigh. I mean I do green bean casserole from cans, but that’s like a treat, like eating twinkies or something. I also pair it with homemade bread and dessert and there’s always some dish at the holidays that takes me a million hours to make but which tastes delicious. I believe you, MH, but alas, I was already kept out of the zoo for other reasons before I knew to go after the peafowl. L/GM- when I was a kid, one night a week each of us got to stay up a bit late and do something w/ our mother. Usually this was baking cookies or something like that. It was fun and I learned many of the basics of cooking, and lost any fear of it, from that. I think doing something like that is a good idea. Steve sounds like the target audience for the “Stag Cookbook, Written for Men by Men,” a 1922 compendium of recipes provided by male (largely Republican) politicians that they cooked for themselves while away from the wives in Washington. Highlights include Warren Harding’s recipe for Waffles, and Senator Reed Smoot’s Peach Cobbler. In a few years, there’s going to be a guy version of Martha Stewart. He’s somehow going to make vacuuming cool. Get ready for it. As usual, I blame capitalism, of course. There will be a special line of guy-friendly cleaning tools, with lots of knobs, dials and accessories. Women across America will be able to buy their husbands vacuums with a clear conscience. I’m an early adopter for this trend (my husband is the steam cleaning guy and keeper of the Roomba). I’m thinking the big seller would be a remote-controlled Roomba, ideally with a Predator drone-style video link and some kind of scoring system for the amount of dirt collected. I’m with Amy P. on this one. If we need to make vacuuming cool to get men to vacuum, so be it. It of course undermines women and their longstanding privations, but so what else is new? At least this diminishes the privations….. I think there is evidence, from time use surveys, that men have increased their cooking more than other domestic tasks, but its a long trend, and can’t explained by celebrity chefs.. Assuming a limited income and some sort of a desire not to start Lipitor any sooner than necessary, if women don’t cook, men will have to cook or cut consumption in other areas to buy healthy prepared food. If women don’t vacuum, you can always pretend the floor isn’t that dirty. Special K. does all the vacuuming chez nous, and I do all the mopping. It’s our little deal, and we both think we win bigtime. Asian fish sauce is a great stealth condiment, as is anchovy paste. Sneak it into salads for that crucial hit of umami. As Meg says, orcestershire also has anchovy as an ingredient and can be used the same way. But I don’t think Gentleman’s Relish is garum–garum was liquid and GR is a paste. My husband is a pretty good cook, but devotes no brain space at all to what’s for dinner until it’s dinnertime, whether he’s at home or work. Result of his superior compartmentalization: I do almost all the cooking. I think Rosin’s husband sounds like a jerk on this issue. If you have strong feelings about how a domestic task should be done, do it yourself or pay someone to do it to your specs. Oh my, you guys are amazing. Garum (you can buy it in UK!)? Worcestershire sauce is a descendant of Roman sauces? the Stag Cookbook, with recipes by politicians! I can make no real contribution, because I am one of the world’s non-cooks. My husband cooks, occasionally, but is a short-cut-taking, compartmentalizing cook. We eat out a lot. Marya — I think the issue at Rosin’s house is that they both want to cook, and that her husband kibitzes when she cooks. It’s not that he won’t cook, but demands perfection from her when she *wants* to cook. (I’ve heard similar complaints from women who are married to architects). I’m envisioning an indoor riding vacuum cleaner with cupholders, something along the lines of the Cat in the Hat’s rig. That sounds like a recipe for overcooked seafood. I guess that’s right about Rosin. I guess her husband doesn’t have any political incentive to let her get on with it however misguidedly, the way a woman would in the opposite situation. Here’s more than you want to know about the manufacture of Thai fish sauce, including brand recommendations. 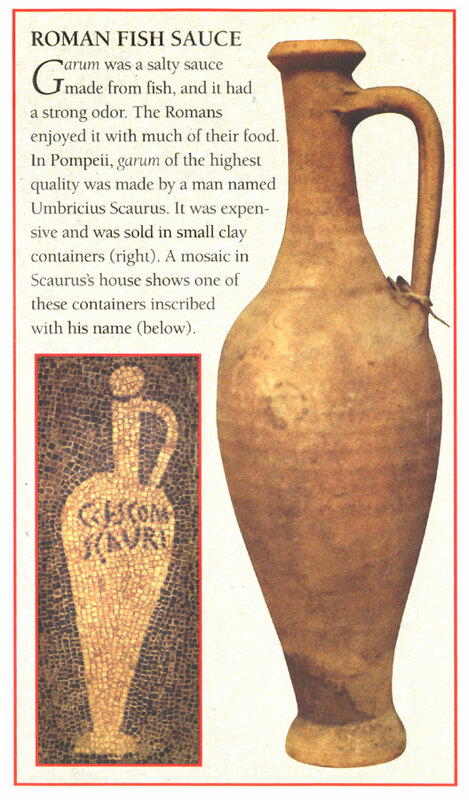 I’m mocking all of you for knowing about Garum. Oh, I like Ancient Rome a lot, Marya. But you’ve got to appreciate that this blog is pretty damn geeky. Geeky in a cool way, of course. I’ve seen plenty of boys get amused by the Roomba. But, the problem is the repetitive chore, no? Do people with fancy lawn mowers with lots of buttons actually like using them to mow the lawn? Or do they just like owning them? The phenomenon I’ve noticed is that the “boys” get excited about the buttons, but once they’ve figured out what all the buttons do, they’re pretty much done with the tool. But, it could be just be the boys I know. (And, “boys” in quotes, because I do believe there are plenty of girls with similar tendencies). @Marya: It’s true the texture of Gentleman’s Relish is different from the garum I’ve made, but the ingredients are the same. And in the 19th century, you could get GR in sauce form as well as spread form. So I’m sticking to my claim, with your addendum. My husband has put a fair amount of energy into keeping our Roomba running and the Roomba itself does nearly all the repetitive stuff. As soon as the lawnmowing equivalent becomes affordable, we are so there (although I’m more than a bit scared by the prospect of a robotic lawnmower). Garum reminds me that I should take time to appreciate the French for inventing mayo. Are you sure that Gentleman’s Relish is fermented? That’s news to me. Also I thought it had butter in it. I haven’t read the article, but I need to; I may be frustrating the same way. I may be frustrating the same way. I’m guessing so. I thought you had to basically sit at the stove and stir risotto. Which isn’t what I’d call easy. Fish juice sitting in the sun for three months? Mmmmm. Bet it’s great spread on toast. I’ve heard that a rice cooker can help with risotto, but purists probably disapprove. I’m waiting for the counter-top appliance that will make my smashed fish smell like they’ve been sitting in the sun for three months, but without the wait.